At Campwin Beach House Bed & Breakfast, your hosts John and Robyn have created the perfect environment for you to take time out and leave the stress of day-to-day living behind. If you are looking for a beachside holiday you couldn’t get much closer than this. The only thing separating you from the beautiful Coral Sea is your hosts' home; no roads to cross, just a 50 metre stroll along the boardwalk at the side of the house has you taking in spectacular ocean views and more than two kilometres of sandy beaches. You may be lucky enough to see whales just offshore in migration season (July to September) or spot some playful dolphins. Turtles nest on the beach between October and January and it is an amazing sight to watch the hatchlings dash to the ocean. Prepare yourself for one-of-a-kind sunrises. Our private two-bedroom guesthouse is separate from the main house and is fully self contained. Bedrooms are air conditioned and luxurious linen is provided. 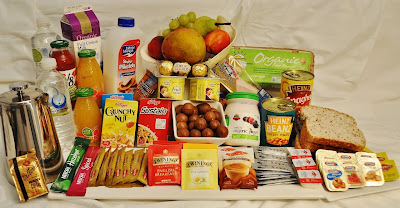 A comprehensive breakfast hamper (both continental and hot supplies) is included for you to enjoy at your leisure or perhaps a beachfront barbecue appeals more. A beachfront table and barbecue is provided for your use. Sleep in, catch a fish for lunch (rods provided), sample delicious oysters and mussels straight from the rocks, pick fresh herbs from our organic garden, enjoy a tranquil beach walk (often you will be the only one on the beach), or relax beachfront and finish your day by drifting off to sleep to the sound of the waves.